Alberta's capital is the city of Edmonton. Its most populous city and metropolitan area, Calgary, is Alberta's commerce centre and is located in the southern region of the province. Other major cities and towns include Banff, Camrose, Wetaskiwin, Fort McMurray, Grande Prairie, Jasper, Lethbridge, Lloydminster, Medicine Hat, and Red Deer. The Premier of the province is Ralph Klein. 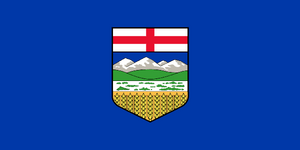 Alberta is in western Canada, with an area of 661,190 km² (255,287 mi²). Southwards, at 49° north, it borders the US state of Montana. Eastwards at 110° west it borders the province of Saskatchewan. At 60° north it is separated from the Northwest Territories. To the west, its border with British Columbia follows the line of peaks of the Rocky Mountains range along the Continental Divide, which runs northwesterly, until it reaches 120° west, at which point the border follows this meridian to 60° north. With the exception of the southern section, the province is well watered. Alberta contains dozens of rivers and lakes ideal for swimming, water skiing, fishing and a full range of other water sports. There are a multitude of fresh-water lakes each less than 260 km² situated in Alberta, and three of more considerable size. These are Lake Athabasca, 7898 km², part of which is in the province of Saskatchewan, Lake Claire, 1436 km², and Lesser Slave Lake, 1168 km². Northern Alberta has fewer frost-free days than southern Alberta, which is almost desert-like in its summer heat and lack of rain. Western Alberta is protected by the mountains, and enjoys the warmth brought by winter chinook winds, while eastern Alberta is flat, dry prairie, where temperatures can range from very cold (−35°C (−31°F) in the winter) to very hot (+35°C (+95°F) in the summer). Central and southern Alberta are the most likely places in Canada to experience tornadoes because of the summer heat, and violent summer thunderstorms are common in the eastern half of the province. Overall, Alberta has cool winters, with a daytime average of about −10°C (14°F) in the south to −24°C (−12°F) in the north. In the summer the temperature averages about 13°C (55°F) in the Rocky Mountains and 18°C (64°F) in the dry prairie to the south-east.